All of these except the last one are biographies of key figures in early America. In each biography, Fritz focuses on a representative quirk of each individual she profiles, which serves as a unifying thread for the important events of that person's life. For John Hancock, whose signature looms so large on the declaration of independence, this is his desire for attention and the ostentatious ways he went about trying to get it. 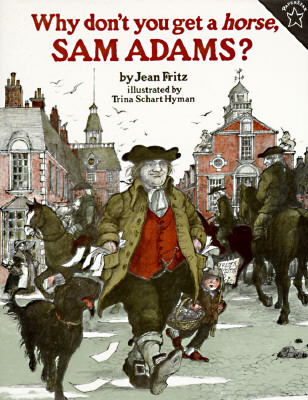 For Sam Adams, it is his refusal to learn to ride a horse, for Columbus, his terrible sense of direction and tendency to stumble upon good fortune, and for King George, his blind paternalism toward the colonists, even when they have made very clear their disdain for him. In the last book, Shh! We're Writing the Constitution, Fritz tells the story of the difficulties and compromises that occurred among different historical figures as the U.S. Constitution slowly took shape. In both types of books, Fritz focuses heavily not just on historical events, but on the personalities of the key figures who contributed to the outcomes of these events. 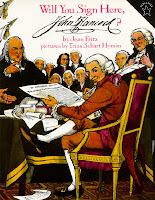 Fritz does not simply idolize these men for their greatness; instead she shows both how they were ordinary (stubborn, foolish, insufferable, laughable, quirky, selfish, etc.) and extraordinary. No one is treated as all good or all bad, but instead they are portrayed as very human. For a reader like me who reads books mainly for their characters, I found this approach refreshing and endearing. Whereas I struggle to focus on lengthy informational texts that try to drill details into my memory, the "characters" in each of these books were fascinating to me. As I read in the evenings, I kept saying to my husband, "Hey did you know...?" and "I never knew that..."
None of these books is enough on its own to convey all the details of the discovery of America, the signing of the Declaration of Independence, the Revolutionary War, or the drafting of the Constitution, but every single one of them provides context for understanding those events on a more personal and emotional level. The straightforward facts which are included alongside the biographical details are made more memorable by Fritz's engaging and humorous writing style, and everything she writes about comes to life in a way that school textbooks never could.They would make wonderful read-alouds for elementary kids who are studying colonial America, but they are just as entertaining as independent reads for older readers who want a refresher. Also wonderful are the illustrations for each volume. There are three illustrators for these books: Margot Tomes, Trina Schart Hyman, and Tomie dePaola. Though all three artists' styles suit the mood and content of the books, my personal favorite is Hyman. Her pictures have the most detail, and in my opinion, the most personality. 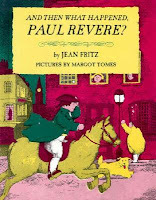 Tomes is a close second - I especially like the way she draws children - but found that I associated dePaola too much with other books and other genres to feel like he was a good fit for this subject matter. Still, I think the designer for these books did a great job of keeping a consistent look to the whole series that places the reader in a particular frame of mind regardless of who drew the pictures. 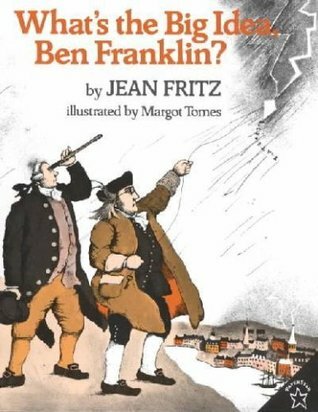 Now that I have read all of these books, I understand why they were so popular in my school library during childhood and why I hear so much about them in homeschooling circles. 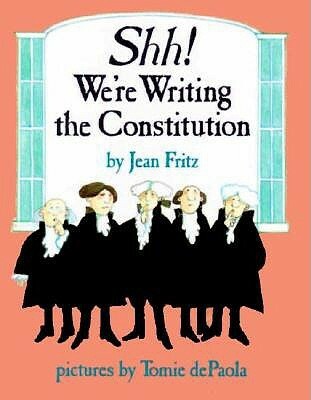 I plan to use them with my kids when we study U.S. history and I hope they will learn to love history (as I never did as a child) by observing how much fun Fritz clearly had writing about it.